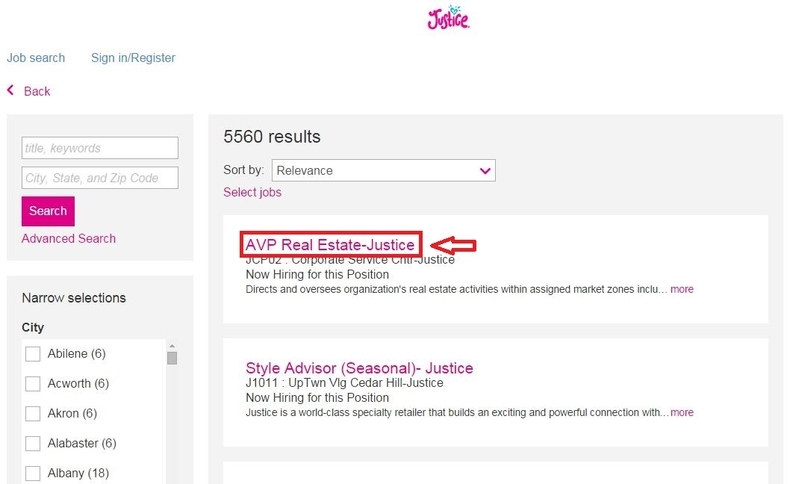 Visit Justice official career site at justiceretail.com or justice.com/careers to know more about the brand and the team. You can scroll your mouse down to the bottom of the page and click “Join Our Team” to move on. In the next page, you need to click “Join our Home & Field team” and start to search job opportunities for you. Enter keywords and location like title, city, state and zip code to quickly find opportunities you are interested in. 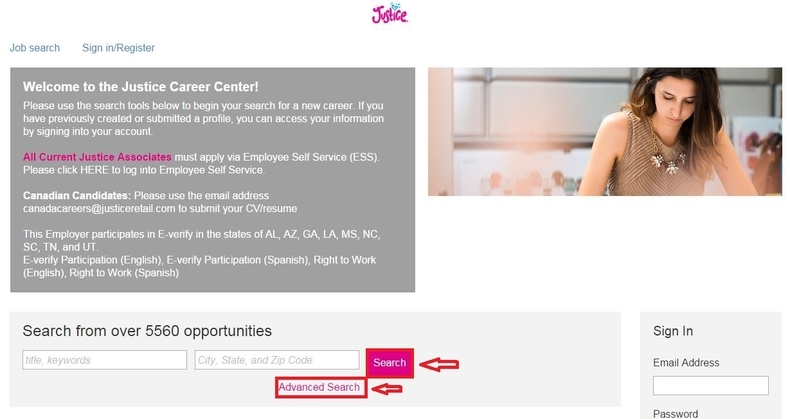 You can click “Advance Search” to use more search criteria or simply click the button “Search” to view the entire job openings list. 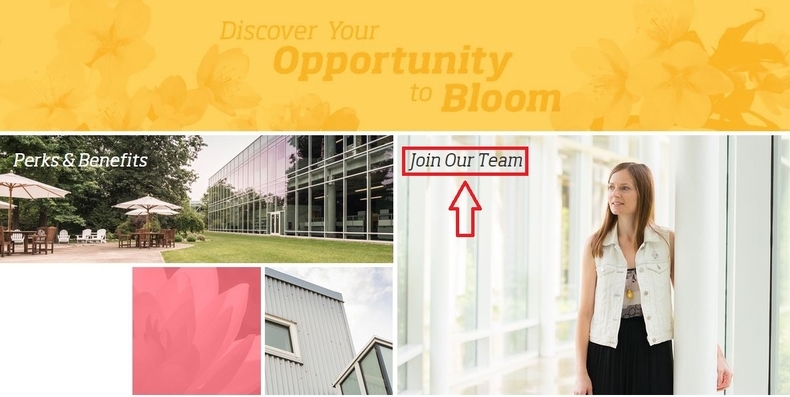 View your search result or the job opening list and select a position for you. 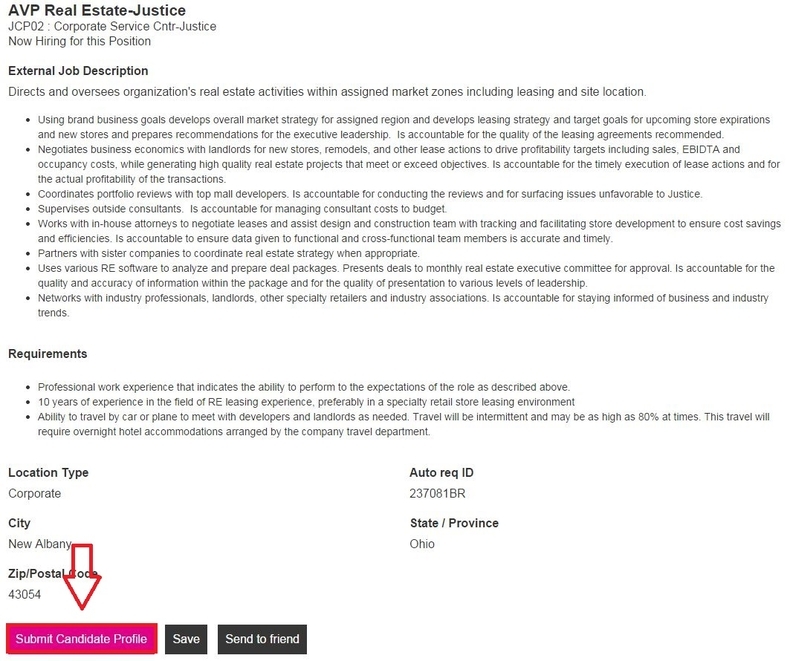 You can narrow your selections by city, reporting location, state or province and then click the job title to move on. Here we just click the first job title to set an example for you. After the previous step, you will be directed to a page where you can view the details of the position, such as job description and requirements. In case you match the minimum requirements, you can just click the button “Submit Candidate Profile” to move on. Fill out your contact information like name, address as well as work experience and education history to build your profile. Fields marked with an asterisk are required. 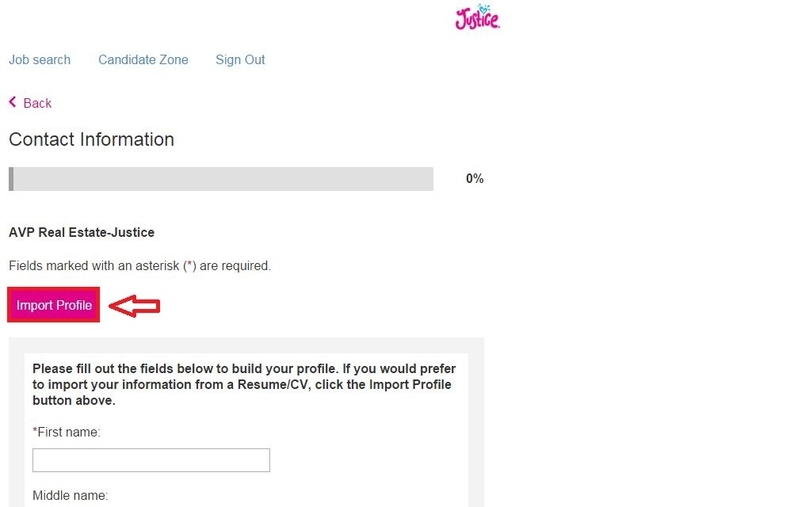 Once you finish all the required fields, just click the button at the bottom of the page to save and continue and upload your resume in the next step. If you would like to import your information from a resume, just click the Import Profile button at the top of the page. 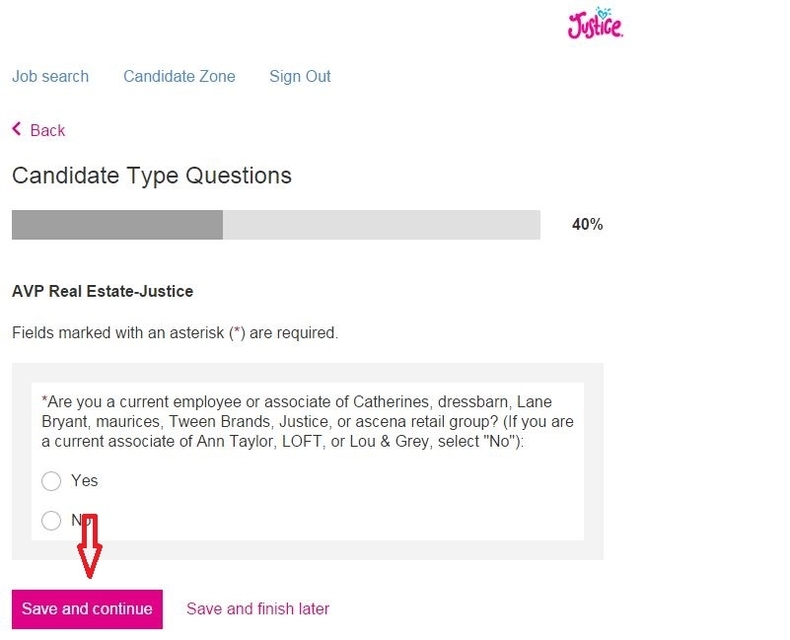 Follow instruction to finish the rest steps, such as answering several candidate type questions, providing additional candidate information and indicating candidate source. When you finish all the required fields in each step, just click the button “Save and continue” at the bottom of the page to move on to the next step. The final step is to review your application. You’d better review your application by checking the accuracy of the information you provided before you submit it. You can click the editing icon on the upper right corner of each part to modify the corresponding information. 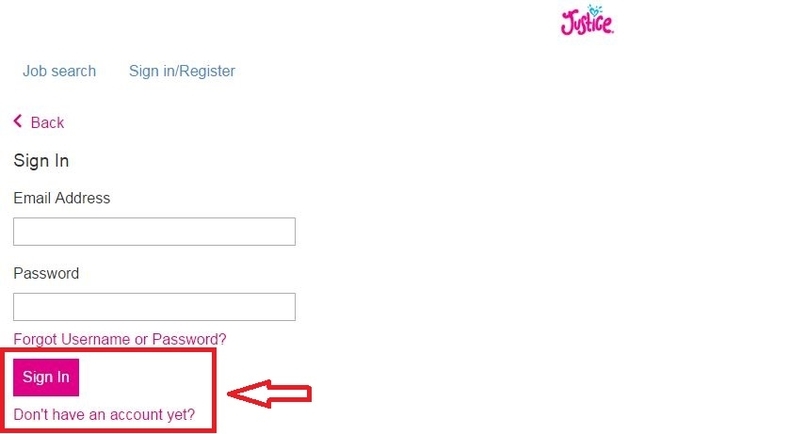 If you are sure that all the information you provided is okay, just click the button “Send my application” to submit your application. After submitting your application, you will be led to a page where you can see the notification “Profile Submission Complete”. This means your online application has been finished. You can click the link below the notification to start a new search. 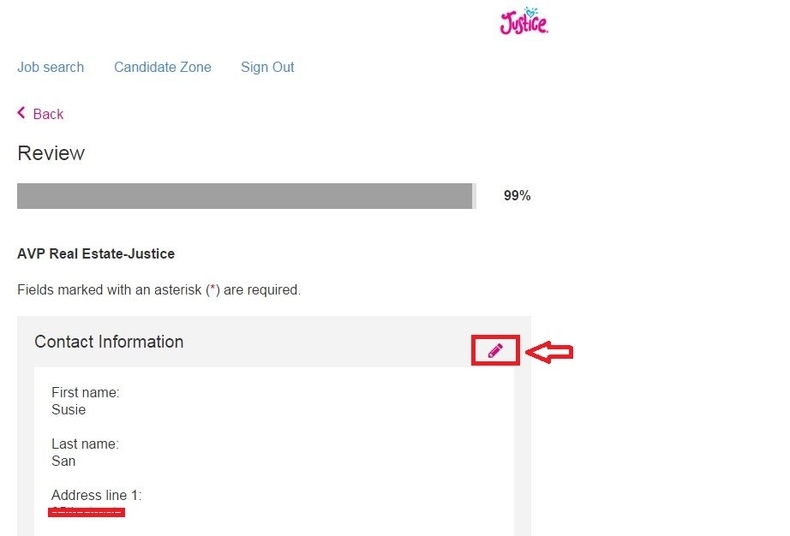 Click justice.com/careers to apply for Justice jobs online.